By hungry runner on December 24th, 2012 . Filed under: Blogs, Cupcake Ideas, Recipes . If your house is anything like mine I’m sure your spending today baking and cooking! We already have three types of cookies made and a fourth cookie dough chilling. 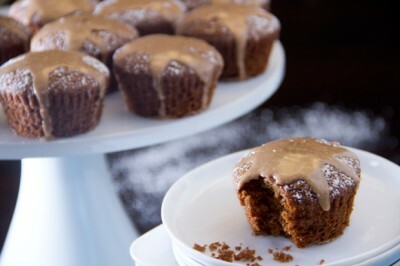 I have a feeling we wont have time to make cupcakes but if we were going to I would bake these skinny gingerbread cupcakes with sweet cinnamon glaze by The Scrumptious Pumpkin. Gingerbread and cinnamon are two flavors and smells that remind me of Christmas and these cupcakes are supposed to be healthy! What kind of cupcakes does your family bake for the holidays? The sweet cinnamon glaze looks amazing! I always use applesauce to cut down on fat on my cake recipes.